It wasn’t until I saw The Deer Hunter that I was fully able to appreciate the talent that is Meryl Streep. Before that, the only big movies I saw Streep in were Music of the Heart, Julie & Julia, Doubt and The Devil Wears Prada. Now, I’m not saying she wasn’t great in those movies – because she absolutely was – I just thought, up to a point, that Meryl was…overrated. I mean how could she be nominated for an Oscar for basically every single role she’s had since Kramer vs. Kramer? What was I missing? I mean, she was certainly talented…but worthy of nearly 20 Oscar nominations? I was skeptical. But then I saw The Deer Hunter…and then I got it. Meryl Streep is a force. She completely immerses herself in every role, letting each part sink into every pour of her being. She’s funny, she’s bold and she’s utterly and completely fearless. You might think, “yeah but she wasn’t always that way”…and, well, you’d be wrong. Streep has been a force to be reckoned with ever since she took her first steps on stage at Vassar College, then again at the Yale School of Drama. She’s the “Iron Lady” of acting, racking up hundreds of nominations, appearing in dozens of plays (sometimes two or three at a time) and has starred in countless films that have helped showcase her extraordinary talent. 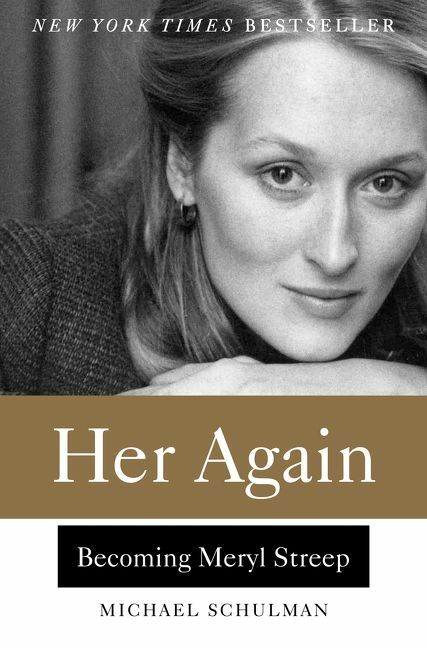 In his eye-opening and beautifully written biography, Her Again, author Michael Schulman (The New Yorker) explores the beginnings of Meryl Streep’s amazing career, prominently focusing on her time at Yale and in the New York theater scene. Burning with talent and ambition, Streep has always stood apart from her peers. She was awarded back-to-back roles in Broadway plays, a handful of roles in Shakespeare in the Park productions and even received a Tony Award nomination before even starring in her first film. Complete with several black-and-white photos and insight from Streep herself, Her Again is a captivating story of a woman coming into her extraordinary talents during a time of immense transformation. It briefly touches on her short-lived love affair with John Cazale, her marriage to Don Gummer, and the start of her Hollywood career, including her roles in The Deer Hunter, Manhattan and Kramer vs. Kramer. Movie lovers all know Meryl Streep from something. They can quote her witty dialogue from The Devil Wears Prada or find sympathy with her tortured portrayal of a mother going through a nasty divorce in Kramer vs. Kramer. She’s played Shakespearean characters, public figures and your every day mother or teacher. What most of us know about Streep is what we’ve seen in her films; however, Streep is so much more than the sum of her parts, so to speak. She is a strong, confident woman who refuses to stop for anyone. She continually challenges herself, shining even brighter when she’s so clearly out of her comfort zone. So, is Streep over-rated? Maybe. She’s even said so much herself. But there’s no denying she’s earned every accolade tied to her name. In Her Again, Streep’s talent shines through, showing how a little cheerleader from New Jersey would grow up to become a Hollywood icon. I saw Deer Hunter when it first came out – she was amazing and then again she was amazing in “Out of Africa” and “Sophie’s Choice” although – I was not crazy about the latter of the two. Her performance was…. so powerful. Been a HUGE fan forever.